Cindy Dollar is cooking up some local granola right here in Goleta. The flavor of August is Raisin Pecan. Delicious, nutritious and oh so nutty – this granola is perfect addition to all our yummy fruit in the box this week. We purchased 15 more chicks from island seed and feed over the weekend. There are 7 different varieties total, so I’m very excited to keep you in touch with them as they grow into adults. 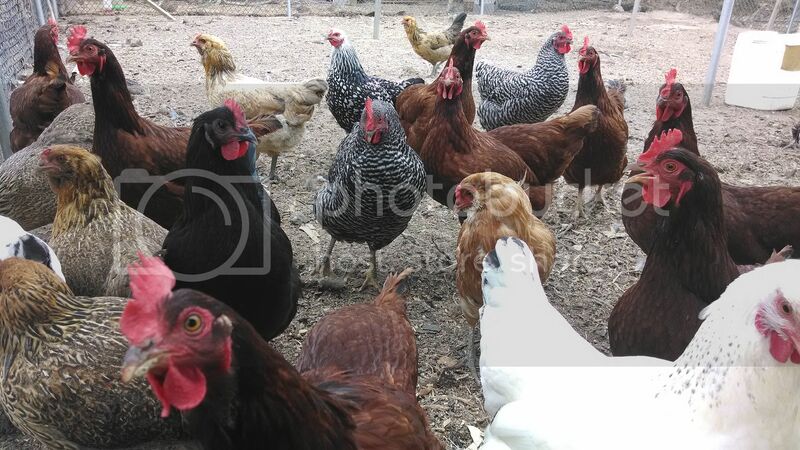 We have a lot of mini chicken eggs at a reduced price in our store this week. The newest laying chicken eggs come out smaller for the first few weeks. We are also offering extra fruit you can add onto your share from Garcia Family farms. I hope everyone is having a great summer so far. This entry was posted in Uncategorized on July 28, 2014 by Carolyn. I’ve been traveling, and while I was away, 18 of our chickens and 1 momma turkey were killed. We think a family of raccoons broke into the coop, but it’s hard to tell at this point. Until I return home I won’t know for sure. We should be able to fulfill egg orders that are secured through your subscriptions, but I need to assess the damage before we put any up in the CSA store for sale. I am so very sad, but we will try to re-secure our coop and be purchasing new chicks try to get back into gear. The lettuce drought continues on the farm. Your lettuce comes from Ellwood Canyon Farms this week. This entry was posted in Uncategorized on July 21, 2014 by Carolyn. When we see lettuce and carrots at the farmers market, in the store and in our CSA boxes every week it may not occur to you how much work actually goes into the planting to make that happen. We harvest our own lettuce seed, hand plant (and transplant) each head, or sow it directly into the ground (depending on the time of year) to keep it on your table all year long. This week we had a failure with our lettuce crop and barely any of the lettuce came up. When these types of things happen it makes me feel extra grateful for all the beautiful lettuce we have had and will have. Unlike most of the country, which experience more extreme temperatures, we are able to grow it all year round. Please enjoy our lettuce free salad recipes below as we anticipate lettuce back in our boxes in a week or two. Your white nectarines come from Garcia Family Farms up in Fresno County. They attend a lot of our local farmers markets and are in transition to become certified organic. I spoke with one of the Garcias this weekend and she mentioned how difficult it can be to make the transition when it comes to filling out paperwork! They have been working on this project for 4 years now and will need 3 more years to receive their certification. We are so happy to share this fruit with you. It’s truly summertime at it’s best. The nectarines will probably need 1-2 days on your countertop before consuming. It’s with great pleasure and pride to announce the newest additions to our flock are laying eggs. I started out all of our chickens specifically for our CSA. So please feel free to add as many as you and your family need. You can also add a reoccurring weekly order of as many dozen as you need to your CSA share. This will guarantee your eggs for the week. We’ve purchased some new packaging, but the eggs remain the same. The black and white birds are the newbies and the rest we’ve had since the beginning. I took this picture when I was hanging out with the flock today. 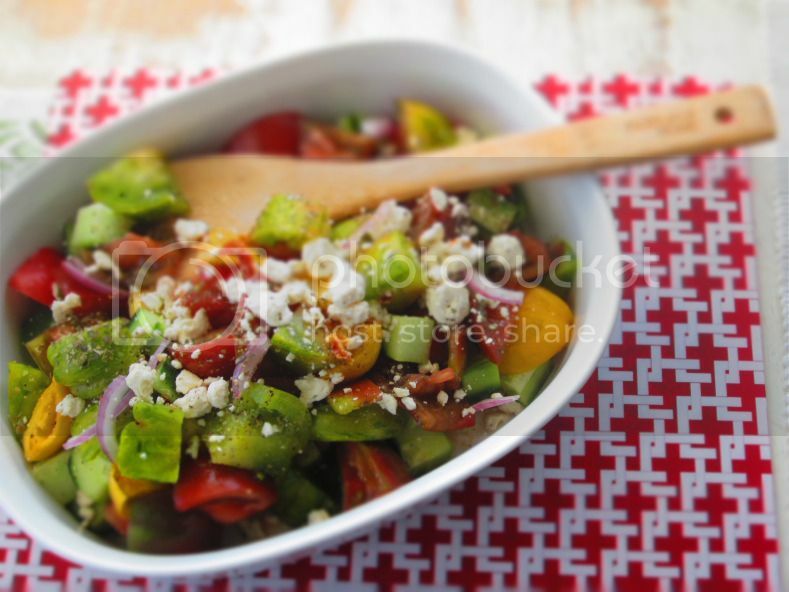 Toss together chopped tomatoes, cucumber and red onion. Drizzle with 2 T. olive oil, 1 T. red wine vinegar, 1/4 tsp oregano, 2 grated garlic cloves, sea salt, pepper and feta cheese. Toss to coat and chill until serving. Serve as is or over fresh arugula or baby spinach. Serves 8, serving size about 3/4 cup. Garnish with fresh chopped parsley or basil, if desired. Soak and gently agitate collards in a big bowl of cold water several times until the water runs clear. 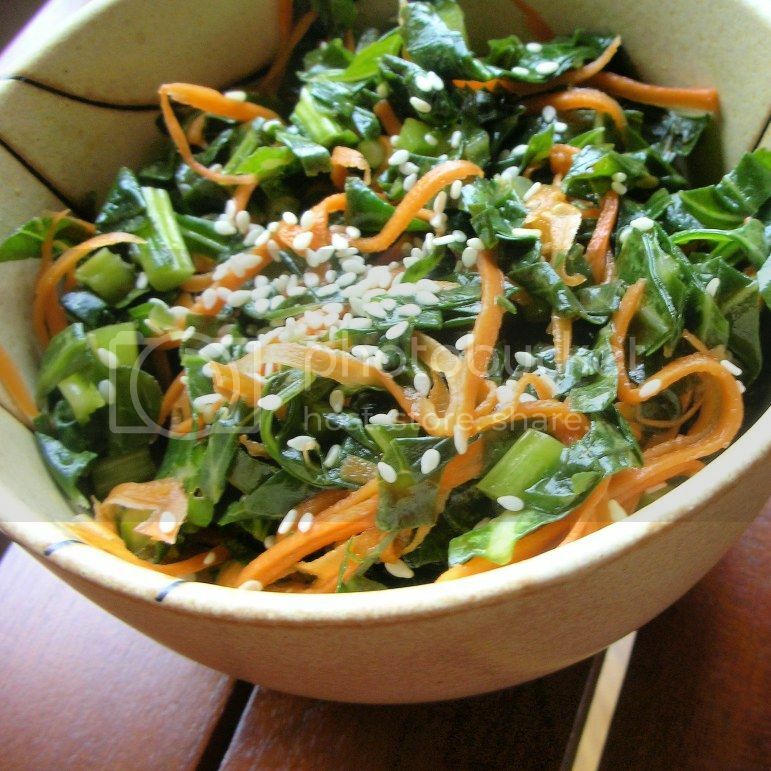 Pat collards dry and chiffonade: roll up 5-6 leaves at a time lengthwise. Because the leaves are pretty wide, I made a cut on each side of the stem. I kept the stem intact because the collards I had were pretty young, but if yours are really fibrous feel free to discard. Then slice widthwise into thin (~1/4 in) strips. Peel the carrots and julienne them. I used my julienne peeler which made this pretty easy. You could use a food processor, but what a pain to clean (plus, I don’t have one). Mix the greens and carrots and add the the vinegar, oils, and a little bit of salt and sugar to taste. Start with just a little bit of salt and sugar (and spicy) because you can always add more later. The sugar is important to cut the bitterness of the greens. The salt draws out some of the flavor. Add a few pinches of sesame seeds for taste, texture, and looks. Let marinate for at least 30 minutes for a crunchier salad, or overnight for a softer slaw. The spiciness does intensify with time. Variations: if you don’t have hot pepper sesame oil, leave it out, or add some red pepper flakes. Try peanut oil instead sesame oil. Chop lemon and basil in a food processor. Stream in oil until it reaches a chunky dressing consistency. Season to taste with salt and pepper. Serve at room temperature. Cook Israeli couscous according to package instructions. Boil an ear of corn for 5 minutes, let cool to room temperature, then shuck the kernels keeping them somewhat intact. Peel zucchini into ribbons with a vegetable peeler. Blanch in boiling water for 15 seconds, drain, bring to room temp. Toss thinly sliced shallot, sliced jalapeño, and halved cherry tomatoes with the chunky lemon basil dressing. Assembly: Spoon couscous over a platter. 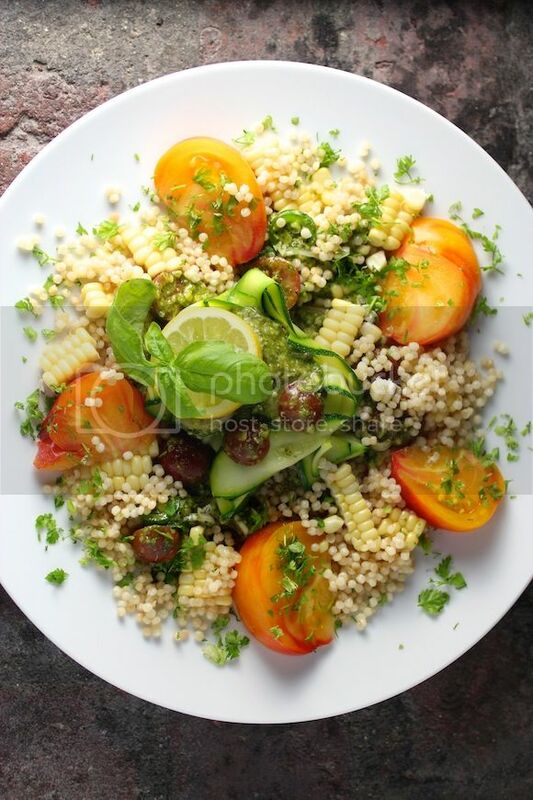 Arrange wedges of heirloom tomato and corn around the couscous. Mound the zucchini ribbons in the center. Generously ladle the chunky dressing over the zucchini. Garnish with lemon wheel, basil sprig, and fresh chopped chervil*. Hello! *Parsley would be a good substitute here if you don’t have chervil. Preheat the grill onto a medium heat in your oven. Place the hazelnuts onto a small baking tray and place under the grill. Cook for 3 minutes and give the tray a shake to move the hazelnuts around and cook for a further 4-5 minutes or until golden. Remove the nuts from the baking tray and tip onto a clean tea towel. Rub the nuts vigorously in the towel to remove the skins. Place onto a cutting board and roughly chop. Place a large fry pan over a high heat and place in the olive oil bring the oil up to a high heat and place in the green beans. Sauté the beans for 5-6 minutes. Add the garlic and chili and sauté for a for further 2-3 minutes. Add in the zucchini ribbons and toss for about 30-40 seconds. No longer. The heat form the beans will continue to cook the zucchini. 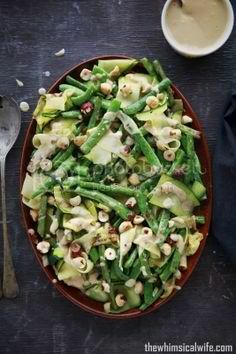 Place the zucchini and beans onto a serving platter and sprinkle over the chopped hazelnuts. Drizzle about 2 -4 tablespoons of the dressing over the salad and serve immediately. This entry was posted in Uncategorized on July 14, 2014 by Carolyn. Strawberries took an unexpected dive this last week. We picked for the farmers market this past weekend and the berries were few and far between. Unfortunately they are not fond of this hot weather and produce less as the temperature increases. This week we included Lane Late Naval oranges from Vincent Farms. They are super sweet, but have a tough peel and are better sliced with a knife. These oranges were grown right here in Goleta and required no labeling and very little gasoline to get them to you. We are testing out some peaches from Garcia farms this week. They have been in transition into an organic farm for about a year now. I’ve been sampling them at the farmers market and they are beyond delicious. If everything works out well this week you will see them in all the boxes next week. Cindy dollar, a local chef is cooking up some delicious granola for us this month. July’s flavor is Walnut Spice Granola. It’s great to sprinkle on top of all your summer fruit! Check it out here in our CSA store. This entry was posted in Uncategorized on July 7, 2014 by Carolyn.